For many private wealth management firms, partnership accounting is both a necessity and a challenge. 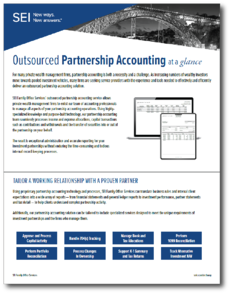 As increasing numbers of wealthy investors move towards pooled investment vehicles, many firms are seeking service providers with the experience and tools needed to effectively and efficiently deliver an outsourced partnership accounting solution. Download our Outsourced Partnership Accounting Solution Overview to learn how SEI Archway uses highly-specialized knowledge and purpose-built technology to deliver exceptional administration and accurate reporting services for your investment partnerships.